It’s always fantastic when people reach out to Savitri and chose to support our work and we wanted to take this opportunity to thank Niki Richards and her group of ambitious and inspiring students from Regent’s University, London who generously decided to do just that. They are part of The Regents University Luxury Society (RLS), an international network of young professionals and post graduate students united by their shared interest in the luxury industry. The society aims to bring students and professionals together to provide industry knowledge, networking opportunities and career planning. 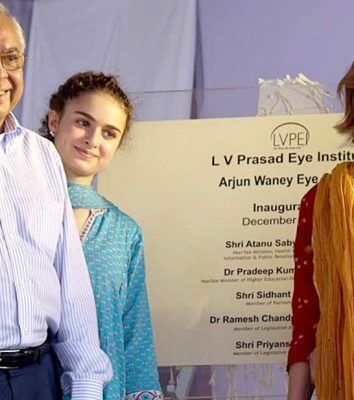 President of RLS, Anne de la Mothe Karoubi shares her thoughts on the importance of giving back whilst working in an industry surrounded by so much wealth: “Savitri was a logical choice for us, since it supports a number of different healthcare and community development projects throughout India and Nigeria. We were so happy to find a charity that is focused on engaging and educating young girls. Also, Savitri is closely linked to many successful luxury restaurants in London; it was a logical step to support an organization that is closely linked to ventures within our community.” The girls decided to host an informal panel discussion that focused on important trends within the industry. Panelists included Ian Hardy of LVMH, Lindsay Davis of Quintessentially, Robin Colgan of Land Rover and Ruth Harrison of Thought Works. Funds raised from ticket sales allowed 100% of RLS’s generous donation to go towards supporting girls from Bihar who are studying to be optometrists at Akhand Jyoti Eye Hospital.